You are here: Home / Germanna Blog / In Memorium: William “Bill” Fishback Sr.
Bill Fishback descends from the Germanna colonists Johannes and Agnes (Haeger) Fischbach [Fishback]; the Rev. Henrich & Anna Catharina (Friesenhagen) Haeger; Johan Jost & Maria Cathrina (Otterbach) Mertin [Martin]. He is a descendant of the “Fleetwood” Fishbacks (a colonial home in Fauquier County visited by attendees of the annual Germanna Foundation conference and reunion). No one in Bill’s line left Virginia in the 300 years since settling in at Germanna in 1714. 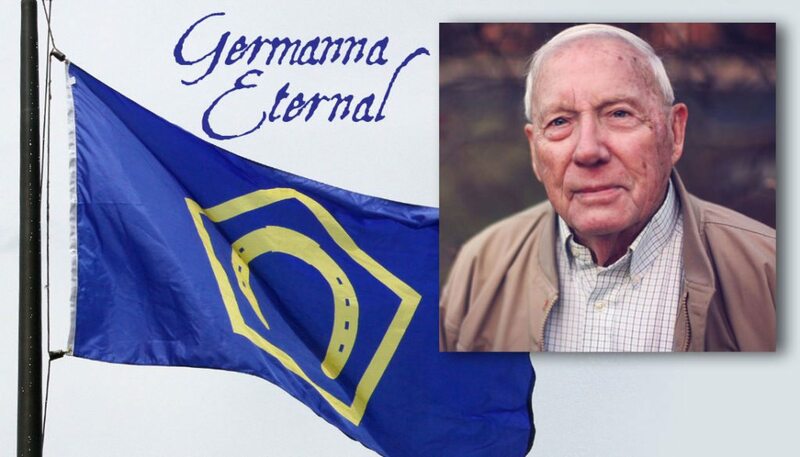 The family of Germanna extends its condolences to Bill’s family. William Edward Fishback Sr., 90, passed away on March 12, 2017 under the loving care of the staff at Culpeper Health and Rehabilitation Center and Heartland Hospice, with family by his side. Mr. Fishback was born in Fauquier County on April 3, 1926 to the late Edward Jackson Fishback and Jessie Jacobs Fishback. A World War II veteran, Mr. Fishback served in the U.S. Army Medical Corp. He worked for Gill Implement Company for 27 years before spending many years at Napa Auto Parts where he retired. Always young at heart, and never one to sit still, he wasn’t retired for long. He worked for The Fauquier Bank for over a decade and operated his own cleaning business until the age of 88. Mr. Fishback’s favorite pastime was spending time with the people he loved most. He is survived by his sons, William Fishback Jr. (Roberta) of Ludington, MI and Richard Fishback of Bracey, VA. He is also survived by his brother, Carter Fishback of Midland, VA, sister, June Childress, of New Baltimore, VA, grandchildren, Jenifer (Jacob) Gozart of Aldie, VA, Amanda (Erick) Kling of Jeffersonton, VA, Jason Fishback of Salt Lake City, UT, Justin (Elizabeth) Fishback of Winchester, VA, Julie Roberts of West Jordan, UT, Jonathan Fishback of Prescott, AZ, Jared (Sara) Fishback of Winchester, VA, Jeffrey Fishback of Prescott, AZ, Richard (Monica) Fishback of Virginia Beach, VA and 16 great-grandchildren. In addition to his parents, he was preceded in death by his wife, Emily Jane Ellinger, sisters, Pauline Fishback and Ann Carrico, and brother, Gordon Fishback. Services will be held at Moser Funeral Home in Warrenton, VA. Visitation will be held on Friday, March 17, 2017 at 2 pm, followed by a memorial at 3 pm. In lieu of flowers, donations may be made to the Orlean Volunteer Fire & Rescue Company, New Building Fund, P.O. Box 15, Orlean, VA 20128.